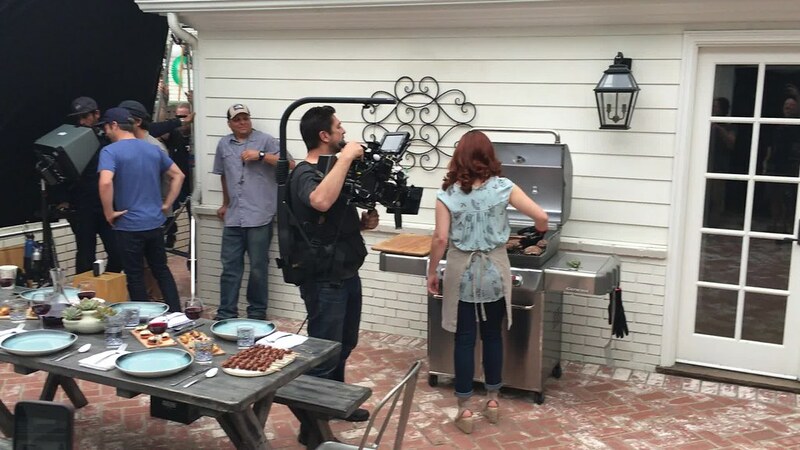 This week, Weber released a new commercial for the Genesis Gas Grill. It was a project we worked on in February. I may be biased, but I think it's pretty fantastic. I've mentioned the shoot previously, but now it's out, I thought it would be fun to post a few more behind the scenes pictures Be forewarned, all of these photos were shot on my iPhone. The spot concentrates on three different "creators" who all have one thing in common, passion for the grill. The butcher vignette was meat heaven, as we worked our way through 80 pounds of prime grade standing rib roasts. I was lucky enough to work again with the ever talented, Kelsey. When dealing with that much grilled meat, a picture is a requirement. The talent for the butcher, while not an actual butcher, was quite proficient with her knives. After some of the meat was cut for her scene, we prepped even more for the grill. Our mission was to fill the grill. Since audio wasn't captured on set, some "background music" was added to capture the momentous occasion of loading up the Genesis with such a huge amount of prime steak. This was easily the best scene of grilled steaks we have ever pulled off. Because things are never what they seem, I included the picture above. Rain hit us hard on the last day of the shoot. The grill in the foreground is being moved to go under the white tent. In the last few seconds of the spot, you may recognize a certain tong flip and plaid shirt. When it comes to moving meat and tongs for the camera, I'm your glove wearing man. Thankfully, my arm looks passing on camera and the tight shots make it look like someone else. Magic! What this final shot doesn't show is it pouring down rain the entire time we were filming. It's amazing what can be hidden or obscured. The homebrewer story is one I'm more than partial to. It was shot at the home of an avid homebrewer. Sadly, our setup was a little tight, so our "grill station" was in the driveway. The magic was in the backyard where he had his garage/brewery. It was incredible. He had an electric all-grain setup which was super slick and highly enviable. It would have been a great place to hang out and made me feel quite inadequate with my own brewing space...let alone brewing! Note to self, I need to brew. For the craftsman scene, the workshop of a carpenter was used. A lot of times artificial light is employed to mimic the sun or a certain mood. For this scene, it was all natural. The sun was in a perfect position to illuminate the backyard as the golden hour rolled through. No movie magic. All nature. For this scene, Kelsey and I worked up pork rib roasts and vegetable stuffed corn boats. The corn boats, pictured here, made it into the final spot. This picture is from when I made them last at home. The recipe, which is fantastic, can be found here. Since this commercial is for the Genesis, everything we grilled came off of a Genesis. Realism counts...and frankly, the Genesis rocks, so why not? One of the fun shots in this clip is the corn hole toss featuring, Art Director, Matt Sharpe. When talent is needed on short notice, you go with who is on hand and Matt was a ready natural. I still laugh whenever I see it. These shoots are a lot of hard work, but also an insane amount of fun. It is always exciting watching the nexus of an idea come together and then finally present itself in its finished form. My friends at Weber and Rabble+Rouser have an undeniable passion for grilling and creativity and just like our backyard heroes, once the passion ignites, it takes off. I'm honored to be along for the ride with this incredible group of professionals. I hope all of this "work" ignites your passion, too. Note: My work for Weber is compensated, but it's really hard to consider it "work."